It’s time again to celebrate the great things Alberta Health Services (AHS) people do every day across the North Zone with our SPIRIT Awards of Excellence in areas such as teamwork, leadership, compassionate care and community engagement. Now in its fourth year, this year’s awards attracted a healthy total of 17 nominations, giving our selection committee a challenge as they pored over the many accomplishments of our finalists to whittle the list down to this year’s recipients. Krista Park, Public Health Inspector, Peace River wins a SPIRIT award for her work in air-quality issues. 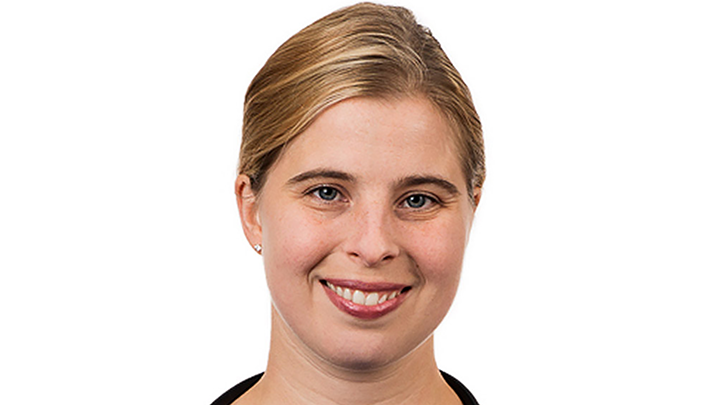 Krista Park exemplifies AHS values as she continuously strives to engage with both her peers and community in providing advice, guidance, and solutions in regard to air quality in the Peace Region. 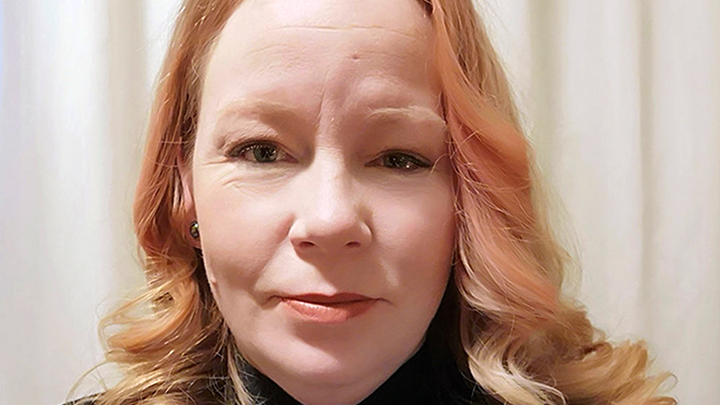 A public health inspector in Peace River, she’s being recognized for her work with the Peace River Area Monitoring Program (PRAMP) since she joined AHS in 2015. PRAMP focuses on air-quality issues by monitoring quality and gathering comprehensive data to permit the identification and appropriate response to odor- and emission-related issues in the region. As a member of the board of directors since the group became a not-for-profit organization, Park encourages and participates in educational outreach on air-quality issues with various partners in schools and at trade fairs, as well as at public meetings. “Through PRAMP I have developed many connections with community members, municipal governments, indigenous groups and industry,” she says. “I value the contributions of all the members of PRAMP, and am happy to contribute whenever I am able. While PRAMP is where I do the most air quality work, I do investigate other air quality concerns in the region. I really enjoy using my expertise to benefit my community. 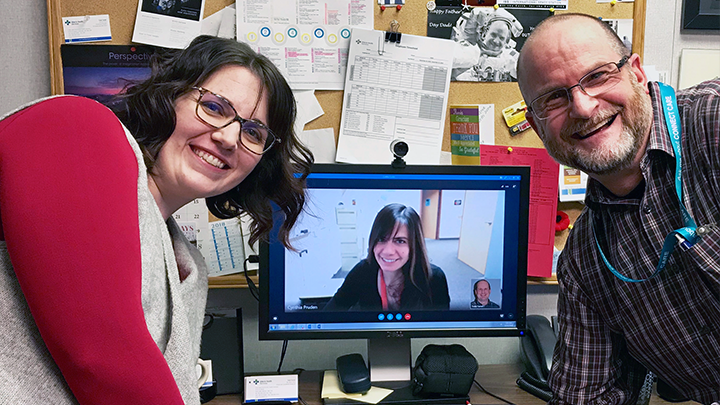 Members of the Innovation award-winning Speech and Language Screen for Adults (SALSA) Team, from left, include Alaina Gamache, Cindy Pruden (via Skype) and Todd Farrell. Not pictured: Vanna Thiel. Innovation and creativity are words often used to describe the Speech and Language Screen for Adults (SALSA) team. Members include Speech Language Pathologist (SLP) Alaina Gamache in Bonnyville, SLP Vanna Thiel and Occupational Therapy Clinic Lead Todd Farrell in Cold Lake and SLP Clinical Lead Cynthia Pruden in Radway. The screen was initially developed in 2014 to address a local need for a quick method to identify patients post-stroke who require a speech language pathology assessment for communication as part of the Cold Lake Stroke Unit Equivalency Care Innovative Learning Collaborative. Over the last four years the team has continued to use and refine the screening tool — and in the spring of 2018, the SALSA was further rolled out to Red Deer and Camrose as part of a quality improvement initiative. Gamache says the team enjoyed a lot of support — from frontline staff and management in Cold Lake, Camrose and Red Deer as well as from the Cardiovascular Health & Stroke SCN, and from Agnes Lehman and Heather Sharpe — to get the project off the ground, and to trial it at the sites. While there’s still work to be done, says Gamache, she’s incredibly proud of her team’s accomplishment. The Innovation award-winning North Zone’s Environmental Public Health (EPH) administrative team includes, from top left: Laura McMurchy, Jennifer Coney and Sheena Lundstad, and from lower left, Nichole Decker, Sheena Mitchell and Tracy Brown. It takes inspiration and teamwork to merge three completely different systems into one — yet that’s precisely what the North Zone’s Environmental Public Health (EPH) administrative team has done over the last decade. 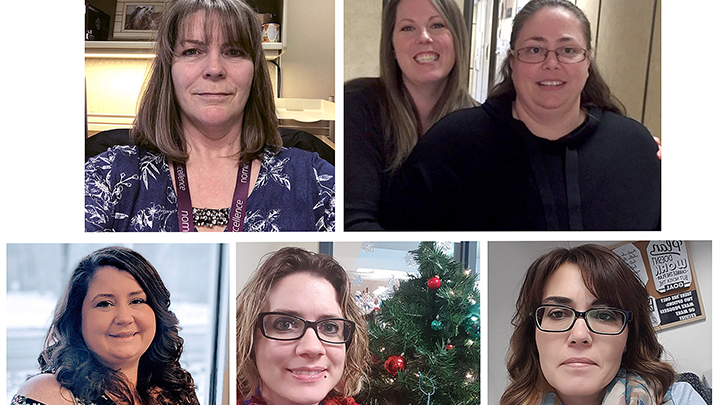 As a unified administrative team that provides operational support to EPH across the zone, Laura MacMurchy in Spruce Grove, Tracy Brown in Peace River, Sheena Mitchell in High Level, Nichole Decker in Fort McMurray, and Jennifer Coney and Sheena Lundstad in Grande Prairie, have been recognized with a 2018 SPIRIT Award of Excellence for Innovation. The team has also created a centralized permitting and billing system, implemented and maintains the Rightfax system for the reporting of animal exposures from emergency centres across the North Zone, and has also centralized CD/OM data entry, just to name a few successful endeavours. Ron Ree, EMS Station Supervisor in Peace River, is one of three recipients of the SPIRIT award for Leadership. One thing that comes with age is wisdom. 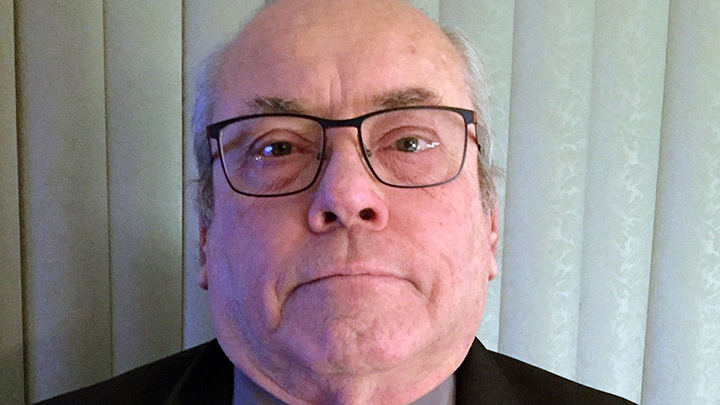 Ron Ree, EMS station supervisor in Peace River, is a living example. As one of this year’s SPIRIT Award of Excellence in Leadership recipients, Ree is the longest-serving peer team member with the North Zone’s EMS Critical Incident Stress Management (CISM) team, having dedicated much of his 35-year career in EMS to this volunteer position. “I was a little shocked and thinking, ‘who nominated the old fart, am I in trouble or something?’ ” he laughs in recalling his first reaction to hearing of his award. Currently North Zone lead for CISM, Ron has mentored and coached many new CISM peers as well as CISM leads over the years. “The young guys really rely on my knowledge,” adds Ree. In the short time since she joined the AHS team in Wabasca, Dr. Sharon Reece has made a significant impact, which is now being recognized with a SPIRIT Award of Excellence for Leadership. A relatively new graduate, Dr. Reece became a full-time member of the medical staff in April, taking on the role of Community Medical Director in November. Dr. Reece’s impact in Wabasca includes improving interdisciplinary communication between nurses and physicians and streamlining the flow of information between physicians and pharmacists. She has also worked with AHS Quality Improvement consultants to optimize the equipment layout and organization of the labour and delivery and trauma rooms. Additionally, she’s introduced simulation training to the healthcare team through the AHS eSIM North Program. Motivated by a desire to improve patient care, Dr. Reece says it takes a team to accomplish that goal. Dr. Magali Benard of Westlock has garnered a SPIRIT award for Leadership. From increasing community education to enhancing the emergency room and inpatient care process, and from working with the Stroke Team on quality-improvement measures, Dr. Magali Benard has brought valuable leadership in the enhancement of the program and, ultimately, care to the community at the Westlock Healthcare Centre. Her work is been acknowledged with a SPIRIT Award of Excellence in Leadership this year. “I would like to express my gratitude and many thanks to the team members at the Westlock Hospital who work with me daily on improving patient care and striving for excellence with much enthusiasm,” says Dr. Benard. Dr. Benard’s nomination notes she has a wealth of knowledge that she’s more than willing to share, and continually empowers and uplifts those around her. “She is a ray of sunshine and calming presence to staff and patients, alike,” reads the nomination. Dr. Enias Mabhegedhe of Wabasca is the recipient of the 2018 SPIRIT Award of Excellence for Compassionate Care. Dr. Enias Mabhegedhe has been making connections in Wabasca for the past five years. It’s his ability to connect deeply with his patients and their families that has earned him a 2018 SPIRIT Award of Excellence for Compassionate Care. 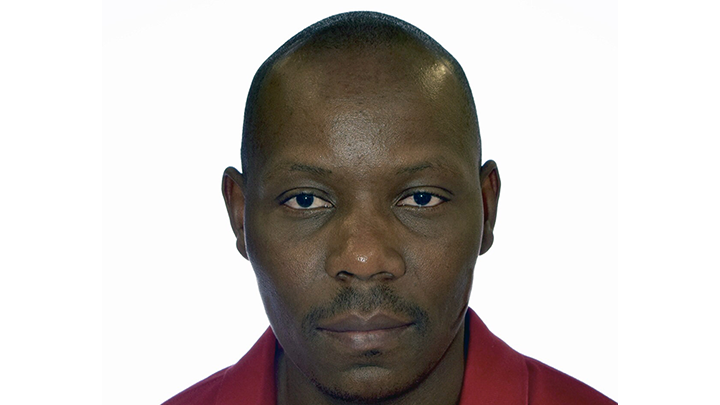 Originally from Zimbabwe, Dr. Mabhegedhe came to Canada from South Africa after having survived civil unrest and violence in both African nations. During his time in Wabasca, including one year as Community Medical Director, Dr. Mabhegedhe “has demonstrated kindness and compassion despite all of his struggles as well as the struggles which face our community,” reads his SPIRIT Award nomination. Living and practising in a small rural community has allowed him to get to know his patients well and to understand their individual circumstances, he adds. Teamwork is the key to success at Hythe Continuing Care Centre — and it’s never been more evident than this year as the team continues to garner accolades. The team’s work was recognized early in the year by the Heath Quality Council of Alberta (HQCA) in its 2017 Long-term Care Family Experience Survey Report of Alberta, which ranked the care centre as the top facility in the North Zone. Hythe Continuing Care Centre was then recognized by the Rural Health Professions Action Plan (RhPAP) with a 2018 Health Care Heroes Rhapsody Award, and now a SPIRIT of Excellence Award also recognizes their great work. With collaboration that reaches from frontline staff to physicians and pharmacists as well as the Family and Resident Council and volunteers, their teamwork approach to person-centred care is a major focus in Hythe.